Fearless Army Monster Truck Derby Stunts is derby demolition battle of monster truck vs car destruction games where race stunts of destruction driver will smash, destroy, damage and demolish reckless monster truck and cars by smashing, hitting and crashing in an exciting monster truck games. Fasten your seat belt, hold your steering tight and hit your derby monster opponents as hard as you can to crash them into pieces in this banger racing games. Fearless Army Monster Truck Derby Stunts is a wreck-fest truck smash game where as a destruction driver Survive the xtreme derby demolition battle with speedy monster truck stunts and speeding over the ramps. Forget the roads it's all about demolition derby racing with thrilling demolition adventure on challenging rough paths. So as a superhero get ready for real war with your big wheel army trucks in challenging Fearless Army Monster Truck Derby Stunts game. Knockout the enemy vehicles using drift cars driving skills. Jump over the ramps and exhibit the fearless car derby racing game stunts. Hit blindly to smash and crash the monster trucks inside demolition arena and win the crash racing destruction battle in best derby games. Become a champion among the monster truck legends and start driving in the arena. Speed up your powerful vintage car and monster jack to destroy your destruction rivals off the track with amazing crash stunts. 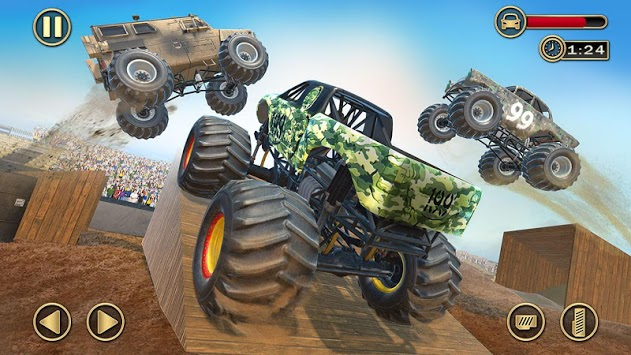 Drive it complete all missions and become the real demolisher in Fearless Army Monster Truck Derby Stunts. 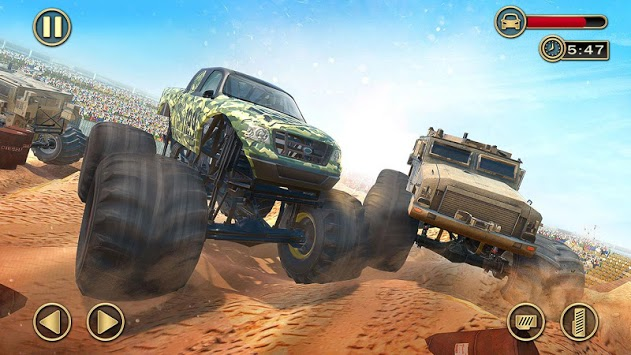 Get ready for experiencing Fearless Army Monster Truck Derby Stunts driving & racing skills in dangerous monster truck demolish battle simulator game of 2019. Be the legend of the Fearless Army Monster Truck Derby Stunts fight league championship and emerge as the last superhero survivor of thrilling monster derby stunt mania! 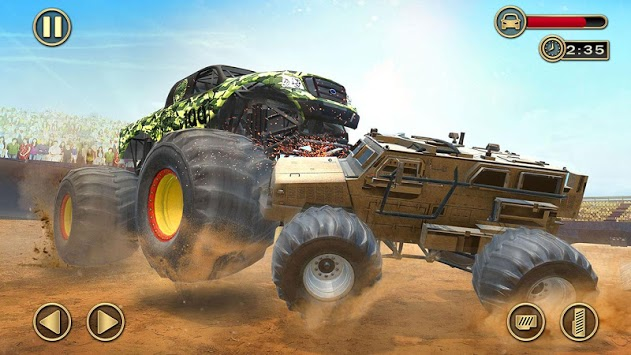 Destruction of cars in monster truck battle with strong opponents inside demolition arena looks so real that you can only win with this derby crash race stunts by properly using windscreens, doors, and mirrors to smash your derby opponents in best of racing games. Speed up just like a monster truck as fast as you can but don’t forget to bypass road hurdles, otherwise you my stuck and crush or crash your game level. As a demolition man you have to push, hit, and damage your opponent’s monster cars. It’s a wipeout in the war zone situation. Only thing for you is to drive and survive Fearless Army Monster Truck Derby Stunts games avoid hurdles and give maximum damage to your derby racing opponents. In this monster truck stunts racing challenge drift cars racing, crash and smash, derby stunt car will take you to a whole new world of demolition battle inside derby arena. To be alive you have to destroy all in this crazy car death racing. You need a extreme driving skills for huge destruction who will never back out from challenging and daring situations. Enjoy an extreme Fearless Army Monster Truck Derby Stunts trucks war racing and win grand arena.